A list of plants that are used as psychoactive drugs. Some of them have been used entheogenically for millennia. The plants are listed according to the substances they contain. Cannabis (Marijuana) is a popular psychoactive plant that is often used medically and recreationally. The psychoactive substance in Cannabis, THC, is unique in that it contains no nitrogen and is not an indole, tryptamine, phenethylamine, anticholinergic (deliriant), or a dissociative drug. Cannabis plants tend to vary, with different strains producing dynamic balances of cannabinoids (THC, CBD, etc.) yielding markedly different effects. Popular strains are often hybrids of Cannabis sativa and Cannabis indica. Some universities and research firms currently study the medicinal effects of cannabis. Many jurisdictions have laws regulating or prohibiting the sale and use of medical and recreational cannabis. Many of the psychedelic plants contain dimethyltryptamine (DMT), which is either snorted (Virola, Yopo snuffs), vaporized, or drunk with MAOIs (Ayahuasca). It cannot simply be eaten as it is not orally active without an MAOI and it needs to be extremely concentrated to be vaporized. 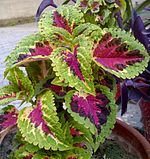 Fittonia albivenis, a common ornamental plant from South America. Acer saccharinum (Silver Maple Tree) was found to contain the indole alkaloid gramine (not active and extremely toxic) 0.05% in the leaves, so it is possible that other members of this plant family contain active compounds. Acacia acuminata, Up to 1.5% alkaloids, mainly consisting of dimethyltryptamine in bark & leaf Also, harman, tryptamine, NMT, other alkaloids in leaf. Acacia aroma, Tryptamine alkaloids. Significant amount of tryptamine in the seeds. Acacia beauverdiana, Psychoactive Ash used in Pituri. Acacia cornigera, Psychoactive, Tryptamines DMT according to C. Rastch. Acacia farnesiana, Traces of 5-MeO-DMT in fruit. β-methyl-phenethylamine, flower. Ether extracts about 2-6% of the dried leaf mass. Alkaloids are present in the bark and leaves. Amphetamines and mescaline also found in tree. Acacia flavescens, Strongly Psychoactive, Bark. Acacia floribunda, Tryptamine, phenethylamine, in flowers other tryptamines, DMT,tryptamine,NMT 0.3-0.4% phyllodes. Acacia longifolia, 0.2% tryptamine in bark, leaves, some in flowers, phenylethylamine in flowers, 0.2% DMT in plant. Histamine alkaloids. Acacia neurophylla DMT in bark, Harman in leaf. Acacia obtusifolia, Tryptamine, DMT, NMT, other tryptamines, 0.4-0.5% in dried bark,0.15-0.2% in leaf, 0.07% in branch tips. Acacia podalyriaefolia, Tryptamine in the leaf, 0.5% to 2% DMT in fresh bark, phenethylamine, trace amounts. Although this species is claimed to contain 0.5% to 2% DMT in fresh bark the reference for this is invalid as there is no reference to Acacia Podalyriffolia anywhere in the reference article. Additionally, well known and proven extraction techniques for DMT have failed to produce any DMT or alkaloids from fresh bark or the leaves on multiple sample taken at various seasons. Should DMT actually exist in this species of Acacia then it exists in extremely small amounts and have failed to produce any alkaloids with Acid/Base extraction techniques using HCl/Na(OH)2. On the same note, more academic research is definitely required into the DMT content of this and other Australian Acacia species with proper chemical analysis of sample. Acacia schaffneri, β-methyl-phenethylamine, Phenethylamine Amphetamines and mescaline also found. Acacia senegal, Less than 0.1% DMT in leaf, NMT, other tryptamines. DMT in plant, DMT in bark. Acacia seyal, DMT, in the leaf. Ether extracts about 1-7% of the dried leaf mass. Albizia inundata leaves contain DMT. Anadenanthera colubrina var. cebil - Bufotenin and Dimethyltryptamine have been isolated from the seeds and seed pods, 5-MeO-DMT from the bark of the stems. The seeds were found to contain 12.4% bufotenine, 0.06% 5-MeO-DMT and 0.06% DMT. Anadenanthera peregrina var. peregrina, Bufotenine is in the seeds. Desmanthus illinoensis, 0–0.34% DMT in root bark, highly variable. Also NMT, N-hydroxy-N-methyltryptamine, 2-hydroxy-N-methyltryptamine, and gramine (toxic). Desmodium triflorum, 0.0004% DMT-N-oxide, roots, less in stems and trace in leaves. Mimosa tenuiflora (syn. "Mimosa hostilis"), 0.31-0.57% DMT (dry root bark). Mucuna pruriens, "The leaves, seeds, stems and roots contain L-Dopa, Serotonin, 5-HTP, and Nicotine, as well as N,N-DMT, Bufotenine, and 5-MeO-DMT." Virola rufula, Alkaloids in bark and root, 95% of which is MeO-DMT 0.190% 5-MeO-DMT in bark, 0.135% 5-MeO-DMT in root, 0.092% DMT in leaves. Virola sebifera, The bark contains 0.065% to 0.25% alkaloids, most of which are DMT and 5-MeO-DMT. Some Graminae (grass) species contain gramine, which can cause brain damage, other organ damage, central nervous system damage and death in sheep. Phragmites australis, DMT in roots. None of the above alkaloids are said to have been found in Phalaris californica, Phalaris canariensis, Phalaris minor and hybrids of P. arundinacea together with P. aquatica. Punica granatum "DMT in root cortex;" The dried stem and root bark of the tree contain about 0.4-0.9% alkaloids. Psychotria viridis, DMT 0.1-0.61% dried mass. Euodia leptococca (formerly Melicope), 0.2% total alkaloids, 0.07% 5-MeO-DMT; 5-MeO-DMT in leaves and stems, also "5-MeO-DMT-Oxide and a beta-carboline"
Coryphantha contains various PhEAs alkaloids including Macromerine Coryphanthine MethOxy-Candicine Corypalmine NMetCorypalmine and like compounds. Cylindropuntia spinosior (syn. Opuntia spinosior), Mescaline 0.00004%, 3-methoxytyramine 0.001%, tyramine 0.002%, 3-4-dimethoxyphenethylamine. Beta-carbolines are "reversible" MAO-A inhibitors. They are found in some plants used to make Ayahuasca. In high doses the harmala alkaloids are somewhat hallucinogenic on their own. β-carboline is a benzodiazepine receptor inverse agonist and can therefore have convulsive, anxiogenic and memory enhancing effects. Lolium perenne, (Perennial Ryegrass), Harman, etc. Ailanthus malabarica, Beta-carbolines. See also Nag Champa. Peganum harmala, (Syrian Rue), The seeds contain about 2-6% alkaloids, most of which is harmaline. Peganum harmala is also an abortifacient. Used by Chinese residents of Mexico during the early 20th century as a legal substitute for opium and currently smoked as a marijuana substitute. Seeds contain high amounts of ergine (also known as LSA, lysergamide, or lysergic acid amide), often 50-150X the amounts found in Ipomoea violacea. Thujone Artemisia absinthium Additive to absinthe. Also called "wormwood"
Produces vivid dreams after smoking. It is also employed by the Chontal people as a medicinal herb against gastrointestinal disorders, and is used as an appetizer, cathartic anti-dysentery remedy, and as a fever-reducing agent. Its psychedelic properties do not become apparent until the user is asleep. Vincristine Catharanthus roseus Catharanthus roseus is (perhaps unpleasantly) "hallucinogenic." Galbulimima belgraveana Galbulimima belgraveana is rich in alkaloids and twenty-eight alkaloids have been isolated including himbacine. Unknown Ilex guayusa Ilex guayusa is used as an additive to some versions of Ayahuasca. According to the Ecuadorian indigenous, it is also slightly hallucinogenic on its own, when drunk in high enough quantities. Lagochilus inebrians Lagochilin is thought to be responsible for the sedative, hypotensive and hemostatic effects of this plant. Blue lotus or lily. Recent studies have shown Nymphaea caerulea to have psychedelic properties, and may have been used as a sacrament in ancient Egypt and certain ancient South American cultures. Dosages of 5 to 10 grams of the flowers induces slight stimulation, a shift in thought processes, enhanced visual perception, and mild closed-eye visuals. 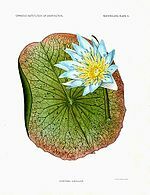 Nymphaea caerulea is related to, and possesses similar activity as Nelumbo nucifera, the Sacred Lotus. Both Nymphaea caerulea and Nelumbo nucifera contain the alkaloids nuciferine and apomorphine, which have been recently isolated by independent labs. These psychoactive effects make Nymphaea caerulea a likely candidate (among several) for the lotus plant eaten by the mythical Lotophagi in Homer's Odyssey. Used in aromatherapy, Nymphaea caerulea is purported to have a "divine" essence, bringing euphoria, heightened awareness and tranquility. Produces vivid dreams after smoking. Unknown Zornia latifolia Zornia latifolia is mentioned in Food of the Gods as "an hallucinogenic substitute for cannabis". It is nicknamed Maconha brava because locals use it as a cannabis substitute. ^ "IJ PACHTER, DE ZACHARIAS, O RIBEIRO - The Journal of Organic Chemistry, 1959 -" (PDF). Pubs.acs.org. Retrieved 22 December 2017. ^ "Profiles of Psychedelic Drugs". paranoia.lycaeum.org. Retrieved 2008-04-19. ^ "Lycaeum > Leda > Acacia acuminata". leda.lycaeum.org. Retrieved 2008-02-23. ^ a b c d e f g h i j k l m n o "Plants & Seeds > A > Acacia spp". Shaman Australis Botanicals. Retrieved 14 January 2015. ^ a b c d Glasby, John Stephen (1991). Dictionary of Plants Containing Secondary Metabolites. CRC Press. p. 2. ISBN 978-0-85066-423-2. ^ "Maya Ethnobotanicals - Ayahuasca, Rainforest Plants, Folklore, Incenses, Art & Visions". Archived from the original on 25 October 2008. Retrieved 14 January 2015. ^ a b c d e f g h Black Panther. "Akacje". Herbarium.0-700.pl. Retrieved 14 January 2015. ^ "Lycaeum > Leda > Acacia auriculiformis". Leda.lycaeum.org. Retrieved 14 January 2015. ^ a b c d e f g Hegnauer, R. (1996-07-30). Caesalpinioideae und Mimosoideae. ISBN 9783764351656. Retrieved 14 January 2015 – via Books.google.com. ^ a b c d e Australian Bush Food and Native Medicine Forum members. "Australian Bushfood (Bushtucker) and Native Medicine Forum". Bushfood.net. Archived from the original on 4 August 2014. Retrieved 14 January 2015. ^ "Entheology.org - Preserving Ancient Knowledge". Entheology.org. Retrieved 22 December 2017. ^ "Ask Dr. Shulgin Online September 26, 2001". Cognitiveliberty.org. Retrieved 14 January 2015. ^ "Dr Karl's Q&A forum". Abc.net.au. Retrieved 14 January 2015. ^ "comp phyto". Users.lycaeum.org. Retrieved 14 January 2015. ^ "acacias and entheogens". Users.lycaeum.org. Retrieved 14 January 2015. ^ "Lycaeum > Leda > Acacia complanata". Users.lycaeum.org. Retrieved 14 January 2015. ^ NMR spectral assignments of a new chlorotryptamine alkaloid and its analogues from Acacia confusa Malcolm S. Buchanan, Anthony R. Carroll, David Pass, Ronald J. Quinn Magnetic Resonance in Chemistry Volume 45, Issue 4, pp. 359–361. John Wiley & Sons, Ltd.
^ a b c "Naturheilpraxis - Fachforum - Die Heilkraft der Akazien – Ein einführender Überblick". 5 January 2010. Archived from the original on 5 January 2010. Retrieved 22 December 2017. ^ "Lycaeum > Leda > Acacia cultriformis". Leda.lycaeum.org. Retrieved 14 January 2015. ^ a b c "Plant Choices - Phytochemeco Databases". Ars-grin.gov. Archived from the original on 27 December 2014. Retrieved 14 January 2015. ^ a b Vivid Interactive and Design. "Rural Industries Research and Development Corporation - Page Not Found" (PDF). Archived from the original (PDF) on 17 December 2008. Retrieved 14 January 2015. ^ "Acacia farnesiana". Hort.purdue.edu. Retrieved 14 January 2015. ^ a b c Hegnauer, Robert (1994). Chemotaxonomie der Pflanzen. Springer. p. 500. ISBN 978-3-7643-2979-2. ^ "Lycaeum > Leda > Acacia floribunda". leda.lycaeum.org. Retrieved 2008-02-23. ^ a b c "Lista över hallucinogena växter, svampar och djur". Wiki.magiskamolekyler.org. Retrieved 14 January 2015. ^ "Lycaeum > Leda > Acacia longifolia". leda.lycaeum.org. Archived from the original on 2007-06-27. Retrieved 2008-02-23. ^ "obtusifolia phyto". Users.lycaeum.org. Retrieved 14 January 2015. ^ "Acacia campylacantha - Hortipedia". www.hortipedia.org. Archived from the original on 2007-10-12. Retrieved 2008-02-23. ^ "Acacia rigidula - Magiska Molekylers Wiki". wiki.magiskamolekyler.org. Retrieved 2008-02-23. ^ "Eins". Factorey.ch. Retrieved 22 December 2017. ^ a b c d e f Granier-Doyeux, Marcel (January 1, 1965). "Native hallucinogenic drugs piptadenias". United Nations Office on Drugs and Crime. Archived from the original on January 20, 2005. Retrieved February 28, 2019. 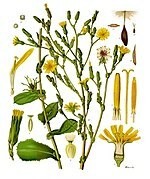 ^ "Cultivo de Curupay, Cebil colorado (Anadenanthera colubrina) y usos, herbotecnia". Herbotecnia.com.ar. Retrieved 14 January 2015. ^ "Bufo alvarius - Jonathan Ott on Bufotenine". Erowid.org. Retrieved 2008-02-23. ^ Stafford, Peter (2013-02-18). Psychedelics Encyclopedia. ISBN 9781579511692. Retrieved 14 January 2015 – via Books.google.com. ^ Ott, J. (July–September 2001). "Pharmañopo-psychonautics: human intranasal, sublingual, intrarectal, pulmonary and oral pharmacology of bufotenine". Journal of Psychoactive Drugs. 33 (3): 273–81. doi:10.1080/02791072.2001.10400574. PMID 11718320. ^ a b "Erowid Online Books : "Ayahuasca: alkaloids, plants, and analogs" by Keeper of the Trout". Erowid.org. Retrieved 14 January 2015. ^ Hegnauer, R. (1996-07-30). Google Book Search. ISBN 978-3-7643-5165-6. Retrieved 2008-05-08. ^ "Desmodium caudatum". Germplasm Resources Information Network (GRIN). Agricultural Research Service (ARS), United States Department of Agriculture (USDA). Retrieved 2008-05-02. ^ a b c d e f g h i "Erowid Psychoactive Vaults : Tryptamine FAQ". Erowid.org. Retrieved 14 January 2015. ^ "Isolation and Identification of Putative Hallucinogenic Constituents from the Roots of Mimosa ophthalmocentra - Pharmaceutical Biology". Informaworld.com. Retrieved 2008-04-20. ^ Hegnauer, R. (1996-07-30). Google Book Search. ISBN 978-3-7643-5165-6. Retrieved 2008-05-07. ^ "Ask Erowid : ID 75 : What is the DMT content of Mimosa hostilis rootbark?". Erowid.org. Retrieved 14 January 2015. ^ "UNODC Bulletin on Narcotics 1969". Archived from the original on 2007-07-08. ^ "Erowid Mucuna pruriens Vault". Erowid.org. Retrieved 14 January 2015. ^ "Kalifornischer Korallenstrauch (Erythrina decora) im GIFTPFLANZEN.COMpendium - giftpflanzen.com". 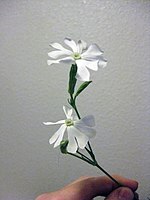 Giftpflanzen.com. Retrieved 2008-04-18. ^ a b c d e "tryptamines: fungi". Bluezoo.org. Retrieved 14 January 2015. ^ Ott, Jonathan (1996). Pharmacotheon. p. 219. ^ "Species Information". sun.ars-grin.gov. Archived from the original on 2004-11-10. Retrieved 2008-04-11. ^ a b "5-MEO-DMT". Tryptamines.com. Retrieved 14 January 2015. ^ Peter R. Cheeke (1989). Toxicants of Plant Origin. CRC-Press. p. 169. ISBN 978-0-8493-6990-2. Retrieved 2008-04-20 – via books.google.com. ^ "Erowid Arundo donax Vaults : Trout's Notes on Tryptamine Content of Arundo donax". Erowid.org. Retrieved 14 January 2015. ^ a b c "DMT, Life and the Universe". Nepenthes.lycaeum.org. Archived from the original on 2008-06-18. Retrieved 14 January 2015. ^ a b c "Erowid Phalaris Vault : FAQ 2.01". Erowid.org. Retrieved 14 January 2015. ^ "Herb Datanz". Herb Datanz. Archived from the original on 12 May 2017. Retrieved 22 December 2017. ^ "Psychotria poeppigiana - Uragoga tomentosa". Discover Life. Retrieved 2013-10-14. ^ "Amazing Nature". Amazing-nature.com. Archived from the original on 27 September 2007. Retrieved 22 December 2017. ^ Servillo, L; Giovane, A; Balestrieri, ML; Cautela, D; Castaldo, D (Sep 2012). "N-methylated tryptamine derivatives in citrus genus plants: identification of N,N,N-trimethyltryptamine in bergamot". Journal of Agricultural and Food Chemistry. 60 (37): 9512–8. doi:10.1021/jf302767e. PMID 22957740. ^ Servillo, L; Giovane, A; Balestrieri, ML; Casale, R; Cautela, D; Castaldo, D (May 2013). "Citrus genus plants contain N-methylated tryptamine derivatives and their 5-hydroxylated forms". Journal of Agricultural and Food Chemistry. 61 (21): 5156–62. doi:10.1021/jf401448q. PMID 23682903. ^ Meyer, B. N.; Helfrich, J. S.; Nichols, D. E.; McLaughlin, J. L.; Davis, D. V.; Cooks, R. G. (1983). "Cactus Alkaloids. LIII. Coryphanthine and O-Methyl-Candicine, Two New Quaternary Alkaloids from Coryphantha greenwoodii". Journal of Natural Products. 46 (5): 688–693. doi:10.1021/np50029a017. ^ N. Meyer, B; S. Helfrich, J; Nichols, David; L. McLaughlin, J; V. Davis, D; G. Cooks, R (1 July 2004). "Cactus Alkaloids. LIII. Coryphanthine and O-Methyl-Candicine, Two New Quaternary Alkaloids from Coryphantha greenwoodii". Journal of Natural Products. 46 (5): 688–693. doi:10.1021/np50029a017. Retrieved 22 December 2017 – via ResearchGate. ^ "Partial List of Alkaloids in Trichocereus Cacti". Thenook.org. Retrieved 2013-10-14. ^ a1b2c3.com. "Trichocereus spp. Information". A1b2c3.com. Retrieved 22 December 2017. ^ a b c d "Erowid Cacti Vaults : Visionary Cactus Guide - Mescaline from Sawdust". Erowid.org. Retrieved 14 January 2015. ^ a b c d e f g "Descriptions of psychoactive Cacti". Users.lycaeum.org. Retrieved 14 January 2015. ^ "Austrocylindropuntia cylindrica". Desert-tropicals.com. Retrieved 22 December 2017. ^ "Cane Cholla (Cylindropuntia spinosior )". Desert-tropicals.com. Retrieved 14 January 2015. ^ a b c "Partial List of Alkaloids in Trichocereus Cacti". Thennok.org. Retrieved 22 December 2017. ^ "Echinopsis tacaquirensis ssp. taquimbalensis". Desert-tropicals.com. Retrieved 14 January 2015. ^ "Cardon Grande (Echinopsis terscheckii)". Desert-tropicals.com. Retrieved 14 January 2015. ^ Venault P, Chapouthier G (2007). "From the behavioral pharmacology of beta-carbolines to seizures, anxiety, and memory". ScientificWorldJournal. 7: 204–23. doi:10.1100/tsw.2007.48. PMC 5901106. PMID 17334612. ^ a b c d e f g h i j k l m n o p q r s t u v w x y z aa ab ac ad ae af ag ah ai aj ak al am an ao ap aq ar as at au av aw ax ay az ba bb bc bd "Cornell University Department of Animal Science". Ansci.cornell.edu. Retrieved 14 January 2015. ^ Callaway, JC; Brito, GS; Neves, ES (2005). "Phytochemical analyses of Banisteriopsis caapi and Psychotria viridis". Journal of Psychoactive Drugs. 37 (2): 145–150. doi:10.1080/02791072.2005.10399795. PMID 16149327. ^ Glasby, J. S. (2002-09-11). Directory Of Plants Containing Secondary Metabolites. ISBN 9780203489871. Retrieved 14 January 2015 – via Books.google.com. ^ "Chemical Information". sun.ars-grin.gov. Archived from the original on 2004-11-21. Retrieved 2008-04-11. ^ "Silbrige Ayahuasca-Liane (Banisteriopsis muricata) im GIFTPFLANZEN.COMpendium". Giftpflanzen.com. Retrieved 2008-04-18. ^ "Erowid Online Books : "Ayahuasca: alkaloids, plants, and analogs" by Keeper of the Trout". Erowid.org. Retrieved 22 December 2017. ^ a b "Passion Flower". Drugs.com. Retrieved 14 January 2015. ^ Ma, ZZ; Hano, Y; Nomura, T; Chen, YJ (April 2000). "Alkaloids and phenylpropanoids from Peganum nigellastrum". Phytochemistry. 53 (8): 1075–8. doi:10.1016/S0031-9422(99)00440-9. PMID 10820833. Retrieved 2008-01-12. ^ Al Zarouni, Yousif (2015). The Effects of Khat (Catha Edulis) (First ed.). London: Yousif Al Zarouni. p. 5. ISBN 978-1-326-24867-3. ^ "Protected Blog". Sliceoftheday. Retrieved 14 January 2015. ^ a b "Erowid Sinicuichi Vault : FAQ (heimia salicifolia Frequently Asked Questions)". Erowid.org. Retrieved 14 January 2015. ^ "Trichterwinde (Ipomoea violacea) im GIFTPFLANZEN.COMpendium". Giftpflanzen.com. Retrieved 2008-04-18. ^ Rätsch, Christian (25 April 2005). The Encyclopedia of Psychoactive Plants: Ethnopharmacology and Its Applications. Inner Traditions/Bear. ISBN 9781594776625. Retrieved 22 December 2017 – via Google Books. ^ "Ololiuqui (Rivea corymbosa) im GIFTPFLANZEN.COMpendium". Giftpflanzen.com. Retrieved 2008-04-18. ^ "Salvia divinorum Clones". Sagewisdom.org. Retrieved 14 January 2015. ^ a b c d "Erowid Online Books : "TIHKAL" - #25 IBOGAINE". Erowid.org. Retrieved 14 January 2015. ^ Dr. B. Bös. "Sternjasmin (Trachelospermum jasminoides) im GIFTPFLANZEN.COMpendium - giftpflanzen.com". Giftpflanzen.com. Retrieved 14 January 2015. Al Zarouni, Yousif (2015). The Effects of Khat (Catha Edulis). London: Yousif Al Zarouni. Hallucinogens on the Internet: A Vast New Source of Underground Drug Information John H. Halpern, M.D. and Harrison G. Pope, Jr., M.D. This page was last edited on 12 April 2019, at 07:33 (UTC).